The Black-whiskered Vireo is a close relative of the Red-eyed Vireo, but are found primarily on islands in the Caribbean. In the United States, they are summer breeding residents in southern Florida, where they are almost always found along coastal areas, particularly in coastal mangrove swamps. Black-whiskered Vireos are often a well-known species in the Caribbean, if not by name or sight, but by their cheerful, repetitive songs that are often heard. They can be readily distinguished from Red-eyed Vireos and other close relatives by the thin, black "whisker" found on their throats below their long, heavy bills. Habitat: Found in mangrove swamps in their limited range in Florida. Elsewhere, they will also be found in tropical forests, usually near the coast, but sometimes further inland. Diet: Feeds heavily on insects and spiders, but will also feed on fruits and berries. Behavior: Feeds by clambering among the branches and foliage of trees, looking for insects. Nesting: The nest of a Black-whiskered Vireo is a small cup built of grasses, weeds, pine needles, animal hair, and seaweed, placed in the fork of a small tree branch. The female usually lays 3 eggs, and she alone incubates them. When the eggs hatch, both parents help to feed the young. Song: The song of a Black-whiskered Vireo is a series of 3 or 4 crisp phrases, sometimes referenced as "whip-tom-kelly". 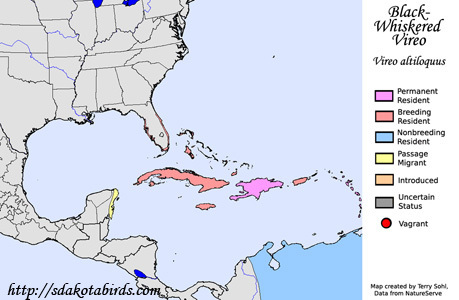 Migration: In Florida and islands of the western Caribbean, the Black-whiskered Vireo is just a summer visitors. They may be permanent residents on some Caribbean islands that are further east. Many Black-whiskered Vireos winter in northern South America. Conservation Status: Populations are stable, they are found over a wide geographic area, and they are relatively common in parts of their range. 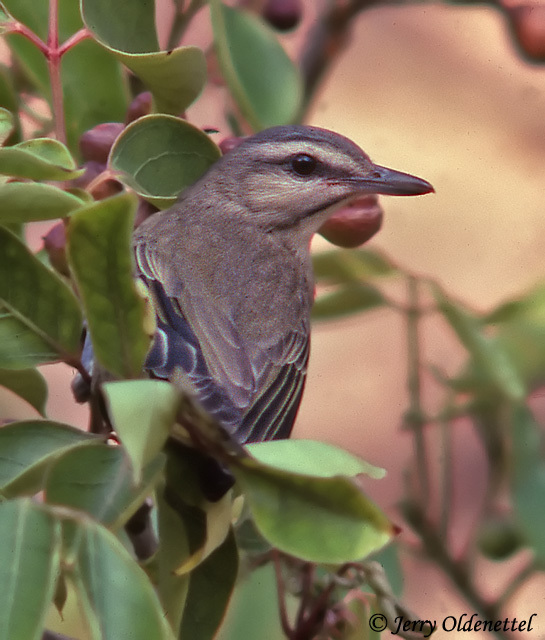 The IUCN lists the Black-whiskered Vireo as a species of "Least Concern". Photo Information: Photo taken by Jerry Oldenettel - February 18th, 2010 - Florida Keys - Photo licensed under Creative Commons Attribution NonCommercial ShareAlike 2.0 Generic License.